Using the EventKit framework it is possible to access calendars on an iOS Device. In this tutorial an iCloud Calendar will be created an event will be added to this calendar. This tutorial is made with Xcode 10 and built for iOS 12. First a new iCloud calendar need to be created. This can be done on an iOS Device or in OS X. Name the calendar ioscreator. If the status is not yet determined the user is prompted to deny or grant access using the requestAccess(to:completion:) method. If the access is granted by the user the insertEvent(store:) method is called. 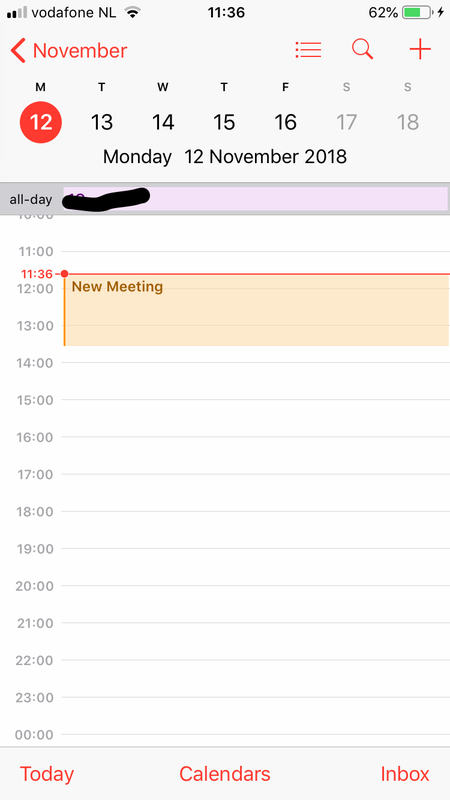 An event is created with a title of "New meeting"
The event is saved into the current calendar. This tutorial can only run on an iOS Device, since the iOS Simulator ha no calendars. Build and Run the Project. The application needs to be authorised to access the calendar. Next, ppen the Calendar app on an iOS Device or in Mac OS X. The New Meeting is added to the calendar. You can download the source code of the IOS8SwiftAddEventTutorial at the ioscreator repository on Github.